At Buyers Access, we translate years of experience and proven expertise into quantifiable results. Sample the case studies below to see how we've helped our clients find exceptional, comprehensive purchasing solutions that meet their property’s needs. The Executive Team of a Property Management Company (Client A) searched for ways to reduce expenses, ensure product consistency, and streamline purchasing for their floorcovering needs across its portfolio of properties which included 5,400 units. Lacking guidance by flooring suppliers on which products to purchase and inconsistent pricing, their challenge was to find the best method to reduce costs and develop a consistent floorcovering program in product and service. To address this challenge, Client A’s Executive Team and group purchasing experts Buyers Access worked together with the key decision maker, their Director of Operations, on their current floorcovering program. Collectively they went on to identify obstacles and recommend solutions that bring uniformity, and cost reduction to a new flooring program. Owner/Manager in Philadelphia, PA with over 10,000 units wanted to standardize, and consolidate product selection. Due to company growth from recent property acquisitions, there was no uniformity in product purchases. Buyers Access conducted a survey which revealed dozens of different faucets being purchased across the portfolio, causing higher acquisition and maintenance costs. The client’s previous Q4 spend was compiled with their primary, national MRO (Maintenance, Repair & Operations) supplier (a BA vendor partner). During the review, Buyers Access analysts discovered over 25 different styles of faucets being purchased. 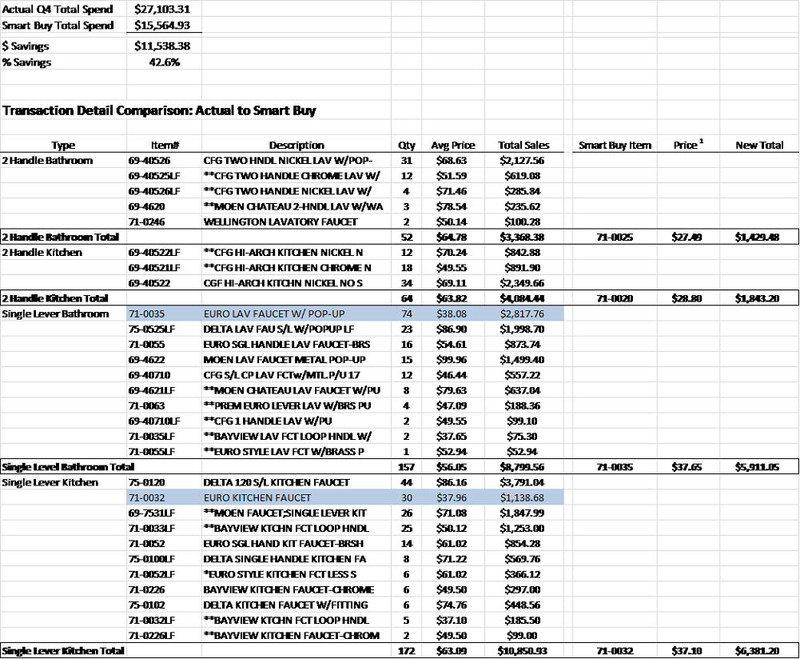 Leveraging the Buyers Access’ extensive vendor network and analysts’ recommendations, the client’s COO, CFO, and Director of Maintenance, selected 4 faucets (2 kitchen/2 bathroom), maximizing purchasing power, and mitigating cost through reduction of redundant inventory (see attached spreadsheet). Buyers Access’ expertise in program implementation, aided the client in communication, training, adoption, and successful roll-out of this standards program. A 42.6 % reduction of spend on faucets, totaling over $11,000 in savings in the first quarter after program implementation. The client realized a reduction of faucet inventory, repair hardware, and labor hours on installation and/or repair. A Management Company based in Boston, MA with over 8,500 units needed a single platform to manage all of their purchasing related activities. Though their properties were using the proprietary websites of their preferred suppliers, the Regional Management and Corporate Executive team wanted proactive controls and real-time visibility into their properties purchasing decisions, a solution to drive item standardization and automation to their accounting processes. To realize these needs, the team engaged Buyers Access to implement a customized Commerce Automation Site. In addition, Buyers Access also deployed a Standardization Program through the use of Item Attributes. Items identified by the client’s Director of Operations & Maintenance are now visible to the entire portfolio for selection and submission into their shopping cart. Finally, Buyers Access implemented a weekly Accounts Payable Feed process, which eliminates the manual invoice vouchering process by the Corporate Office Accounts Payable Team. All orders are now reviewed by the property’s Regional Manager prior to direct submission to the supplier’s order fulfilment system, reducing returns and unnecessary use of budget. Consistency of product used and installed on the properties has increased. Properties can save these Standard items in custom ‘Recurring Orders’ for greater efficiencies and time savings during their purchasing process. Over 5,250 invoices are now fed into the Client’s Accounts Payable system annually. Based on historic metrics, a single voucher may take an Accounts Payable’s team member 5 minutes to enter. The revised process will save the Client’s Account Payable team over 435 hours per year. A Management Company based in North Charleston, SC with over 1,500 units had several properties managing their own purchasing activities using multiple suppliers for purchases. In addition, each property had different ordering, billing and delivery methods in place, leaving inconsistent purchasing behaviors portfolio-wide. After implementation, and thanks to the national buying power of Buyers Access, this management company was able to save 30% annually and standardize their office supply purchases across their portfolio. The client also realized the onsite staff’s ability to order items more efficiently and cost effectively allowed for an increase of leased units in each property. The Buyers Access Smart Advantage purchasing solution helped streamline the procurement process, which continues to save them time and money.